A belated happy Valentine’s Day to you, Cheer Readers! As the love month is coming to a close, here is our last hurrah for love. You never know, you might just meet the Noah to your Paul before this month ends, so it’s best to be prepared! 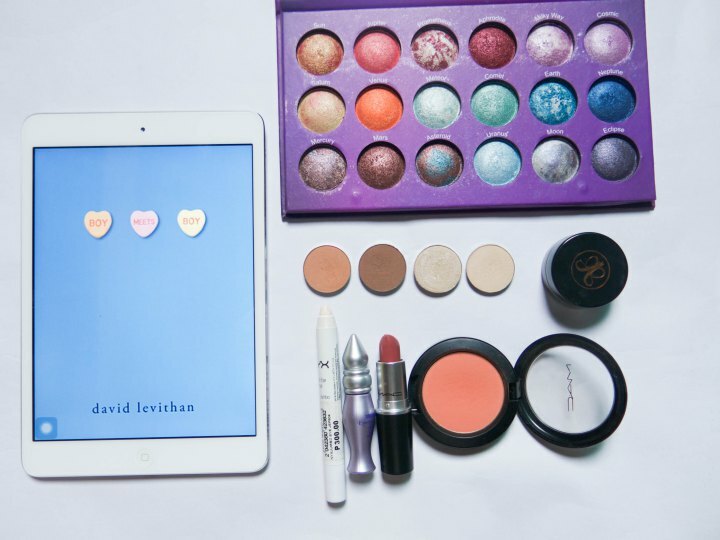 This time, FaceBookIt features Boy Meets Boy by David Levithan. I read this several months ago so the details are not entirely fresh but whenever I see quotes from it on my feed, I remember how I felt when I first read it: happy. The cover looks really simple but it gives you ample room to get crazy with the blues, peaches and pinks to truly reflect how beautiful and wonderful the characters are in this novel. Now I’m going to stop blabbering and just get to it! I started by priming my lids with my one true eyelid primer love, Urban Decay Primer Potion in Original. It really prevents creasing of the eyeshadow and helps up the color game of my shadows, but if you feel having two bases is too much, you can skip the first primer. 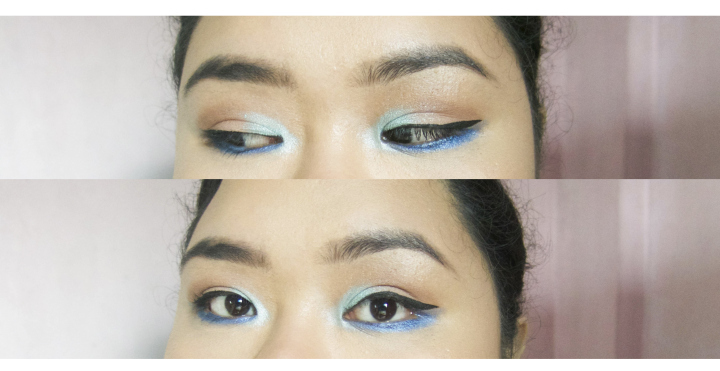 Since I will be using a lot of bright colors for this look, a little nudge from a white base won’t hurt. So after the first primer has been blended evenly on the lid, I added a bit of NYX Jumbo Pencil in Milk to the mobile lid and lower lashline to make sure the colors pop. Using a small blending brush with a little bit of medium brown eyeshadow (Latte), define your crease. Then with a stiff brush, put a shimmery peach eyeshadow with a brown undertone (Creme Brulee) on the center of your mobile lid (make sure you don’t get any on the inner corners), gently blending on to the medium brown. For the inner corners, load up a smaller stiff brush with a mint green eyeshadow (Uranus), blending gently to the center of the lid. For more shimmer/drama, add a bit of a shimmery ivory eyeshadow (Bling) on the inner corners of the eyes. To highlight the brow bone, use a matte eyeshadow slightly lighter than your skin tone (Vanilla Bean). The lower lashline is a whole different story, though! 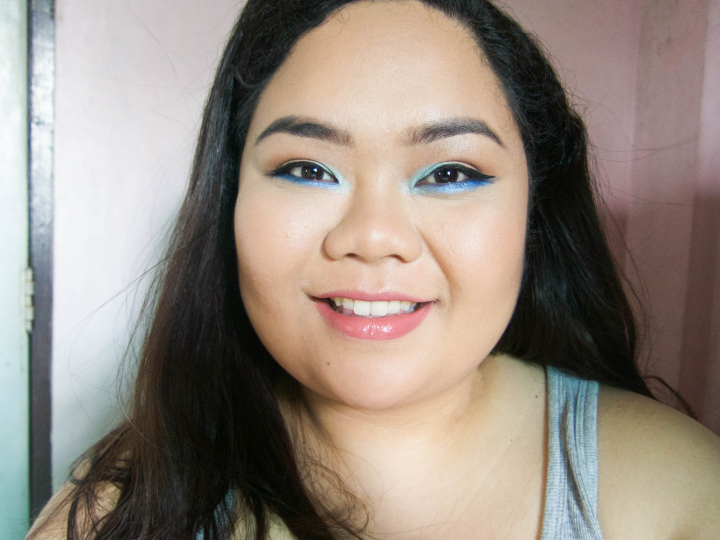 Use a shimmery royal blue eyeshadow (Moon) on your entire lower lashline. It’s up to you to build the intensity of the eyeshadow. First, put on primer (Missha The Style Makeup Base) and foundation (NARS Sheer Glow Foundation in Barcelona). You can conceal pimples, pimple marks, dark undereye areas, etc. if you are into that. Then set your makeup with translucent powder, especially on the T-zone where most of us tend to get oily. Add definition to your face by slightly contouring your cheeks with a neutral brown two to three shades darker than your skin tone (The Balm Bahama Mama) and put on a peach blush (MAC Sheertone Blush in Peaches). Because the eyes have so much going on, best to wear a muted pink shade (MAC Lipstick in Cosmo) and add a bit of gloss (Estee Lauder Pure Color Lip Gloss in Rock Candy). And that’s FaceBookIt Look #5! Hope you guys like it! Reblogged this on Flabs Rule the World!. I love how playful you went with the eyes! I didn’t think you could get the candy hues just right but I love the final look. I think I’m taking NYX Pencil in Milk for pastel colors, too. First read that book back in high school. My girlfriends and I were extremely kilig. :)) Love how the blue just lights your whole face up.